Just in case you haven’t popped in to have a look. 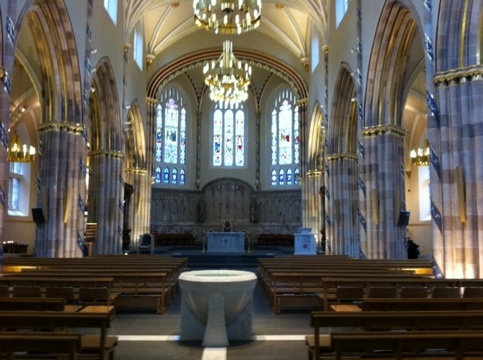 This is the newly-restored St Andrews Cathedral – Cathedral of the Catholic Archdiocese of Glasgow. Magnificent. I was next door yesterday for a meeting of Action for Churches Together in Scotland – about which I shall exercise an appropriate Lenten self-denial. But in the matter of doors, I am amazed how many churches make it difficult to find the way in. They say that, if you want to find out how difficult it is to get to talk to yourself – as it were – that you should ring yourself up. The same applies to the science of getting into churches. The Cathedral defeated me completely at 10 am but persistence was rewarded later on. This entry was posted in Uncategorized and tagged 'st Andrews cathedral'. Bookmark the permalink.